At first glance, the BRAVEN 600 seems like something you’d find in a kitchen more than anything else, since it eerily looks like some kind of cheese grater. However, it’s in fact a Bluetooth speaker that’s donning one intriguing design to differentiate itself from some other offerings. In addition to that, it’s compact enough to bring along on your excursions – while still delivering some potent tones. Sporting a $149.99 price point, it’s undoubtedly distinguished as a premium offering, but the fun doesn’t end at simply being a speaker. In fact, the BRAVEN 600 actually houses a 1,400 mAh battery – thus, giving you the ability to charge your device on the go. Even better is that its size isn’t compromised in any way whatsoever with the added feature. Moreover, in the event that you’re getting a call while streaming a song, its full-duplex microphone is there to ensure that you’ll get the best calling experience. With that in mind, let’s take a look at what the BRAVEN 600 has to offer. 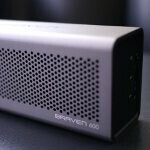 Without question, the most visually compelling thing about the BRAVEN 600 is its solid industrial design. Crafted out of aircraft grade aluminum, its choice of materials and construction exude the qualities of something that’s attached with a premium price. And certainly, it shows its worth, as we love the compact form and sufficient weight accompanying the BRAVEN 600. On the left side of the speaker, we find physical its volume up/down and multi-function buttons that have springy responses when pressed. Meanwhile, we’re also greeted to its power switch, 3.5mm audio-in jack, and microUSB port to charge its internal battery. With the audio jack, however, it’s also used to daisy chain the speaker to another one – essentially increasing its overall audio output. Conversely, the right edge of the speaker is home to its 3.5mm audio-out port, full-sized USB port, and dedicated button to initiate its charging system. With its 1,400 mAh battery, you can literally charge your device while simultaneously streaming music to the BRAVEN 600. Not only is it a portable speaker, but it’s also a battery charger as well – well, just be sure to have your device’s charging cable on hand. As we’ve mentioned, it doesn’t try to hide that it’s a speaker at heart, which is evidence by the grills outlining the front and back of the BRAVEN 600. Inside this bundle of joy, it sports two custom HD audio drivers that deliver 6 watts of total audio output. However, there’s some distortion heard when it’s placed on the loudest setting. Nevertheless, toning its volume down a little bit presents us with sounds that are more distinct – while still producing some good bass tones. Sure, some might be scared away by its $149.99 price point, but when you factor in that it’s an all-in-one speaker and battery charging solution, people might find it reasonable enough to purchase. And honestly, it exudes a design and construction that no doubt complements its pricing.